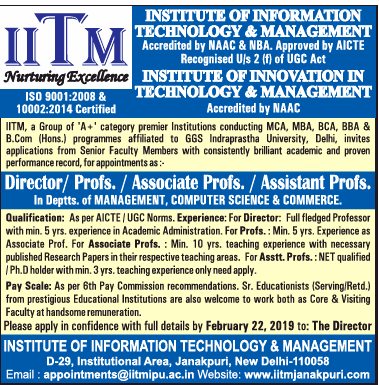 Institute of Information Technology and Management New Delhi has advertised in THE TIMES OF INDIA newspaper for recruitment of Professor / Associate Professor / Assistant Professor / Director jobs vacancies. Interested and eligible job aspirants are requested to apply on or before 22nd February 2019. Check out further more details below. About College: The Institute of Information Technology & Management was setup in 1999 by Mata Leelawati Shikshan Sansthan, a registered education society engaged in various philanthropic activities with H.E. Shri T. N. Chaturvedi, a Padma Vibhushan awardee, as the founder President of both, the society and the Institute. How to Apply: Interested and eligible candidates are requested to send application with their resume along with copies of certificates and recent PP size photo to the following postal address or email address.